As you may have read in my 2011 wrap-up post, 2011 was the year of my feminist awakening. To that end, I've started reading and marking many books that share the feminist experience from different angles and perspectives. 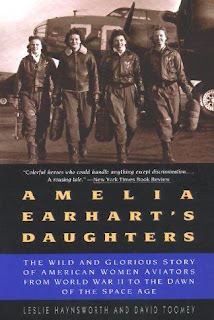 Amelia Earhart's Daughters: The Wild and Glorious Story of American Women Aviators from World War II to the Dawn of the Space Age was one such book. Quite the descriptive title, no? I was very excited to learn about how women used aviation to break down gender barriers and fight for equal rights. That is not exactly what I got from this book, though. In my opinion, it's much more a work of aviation history than one of women's history. There was a lot of terminology I didn't understand, a lot of descriptions of war planes, and many details about breaking records that didn't make any sense to me. I much preferred the first section of the book, on the women aviators of WWII, than the second, about women pilots trying (and failing) to become some of the first astronauts. Female pilots in the US were part of WASP, the Women Airforce Service Pilots. They flew warplanes around the country and often took on the dangerous task of carting targets for the air force pilots to practice on. The authors give us brief glimpses into these women's lives- where they came from, how they became interested in flying, and some of the missions they ran. But to me, it all seemed like more of a list than a biography. We didn't learn about their individual struggles so much as about the general struggle of being a woman pilot. I really wanted to dig deeper and learn about the women themselves, their own hopes and fears and thoughts on the treatment they received. But I didn't get much of that at all. I have a vague sense of all the women being fascinatingly independent and glamorous, but most of the names run together and there isn't anyone that I can think of as being the one woman that defines WASP for me. The second half of the book focuses on the space age and America's goal of putting men in space and on the moon before Russia. This half didn't really interest me much. There are more background details for a couple of the women training to become astronauts, but once they actually entered training, readers received mainly just a very detailed listing of the training and tests they had to go through. I wanted much more meat in the book around their reactions to the training, how discrimination manifested itself, their feelings about the program, what they thought going into space would mean for not just themselves, but for all women. I just wanted a much more deeply emotional and feminist look at the work, but instead got a lot of aviation and space history, which I didn't find nearly as interesting. Perhaps if I really enjoyed reading about different types of planes, then I would have found this book to be "wild and glorious" as promised in the subtitle, but I didn't think the details presented were all that glorious; instead, I thought there was so much more that could have been told but was not. This book did teach me a lot about a woman I had never heard of before, Jackie Cochran. She was an orphan from Alabama who rose up to start her own cosmetics company, take up flying, marry one of the richest men in America, and then used her considerable connections to help start the WASP, give the women veteran status, and lobby for women in space (she wanted to go into space herself, though she was well past the cut-off age). Cochran set all sorts of aviation records, including being the first woman to break the sound barrier. She was obviously a very driven and fascinating woman, and I wish we learned more about her and her contributions. I don't think I would have liked Cochran much as a person- she seemed really self-promoting and in love with her own power, much of it gained from being married to such a powerful man- but her place in history is considerable, and I was glad to know more about her. It's always so great to learn about women who pushed their boundaries, and Cochran was certainly one of those women. This book wasn't quite what I wanted it to be, and I didn't enjoy it nearly as much as I'd hoped, but I think I still learned a lot from it that I would never have known otherwise. If you particularly enjoy war or aviation history, I think you'd like this much more than I did. I think I'd be more interested in the first half of the book than the second half. Too bad the author doesn't provide more detail about the women. Sounds a bit dry to me. You might like Spitfire Women of WWII a bit better, Aarti. I read it last year and I really enjoyed it. It does talk about the women and I thought it was really good. Quite a mouthful for sure, and too bad it was not all that you had wished for. I don't think I would enjoy this one very much, for a lot of the same reasons you didn't. Lots of facts about flying and records would just bore me stiff, and I give you a lot of credit for sticking with it. I probably would have given up! Thanks for the very well delivered and thoughtful review today, Aarti, but mostly for the honesty! Kailana - Yes, I have that one on my wish list for sure, so if I find it I will look into it. It sounds much more focused on the women than this one does. Blodeuedd - It happens sometimes, I guess. Sometimes the information you get makes up for a less-than-perfect reading experience. Sounds like this was the case with this book. I think I'll pass, but thanks for your review! Maybe a novel? Sherri Smith's Flygirl has been on my to-read for a long time; I think I'm inspired to pick it up. (A nod to the friend who recommended it. )It is for younger readers, but I think sometimes those books are good for the emotional side of an historical subject when you already have a lot of knowledge about the facts. Awww; I saw this in your sidebar and was hoping it'd be awesome! I get so frustrated when nonfiction authors get bogged down in mind-numbing details.